This post is also up as a guest post at Emerging Gently. I was going to write a post comparing and contrasting Christian Science Nursing with modern medical nursing until I came to the Churches own page about the topic and read what Christian Science Nursing actually entails, and my desire to write a polite analysis went out the window and I had an overwhelming desire to smash my head repeatedly into a wall. While Official Church Policy states that Christian Scientists are “free to go to doctors or seek medical care” (8) the idea is laughable. To qualify for participation in Christian Science Nursing Facilities, people must abide by standards requiring them to radically rely on prayer for healing (9). All Christian Science Nursing Facilities have a policy that clearly states guests must rely on prayer alone. Christian Science Nursing facilities deny people proper medical care. In September, I had a guest poster, Dr. Spock, describe the House of Horrors Christian Science Nursing Facility were his mother spent her last days (15). I highly recommend reading the entire piece, Spock describes inhumane conditions, unimaginable pain and suffering that would not be permitted in a medical facility or hospice care. I remember a visit to the House Of Horrors early in childhood when my grandmother worked there as a Christian Science nurse. …. . The only comfort the “nurses” [were] able to offer [was] to shift pillows, offer water or juice, or read from the Bible and/or the writings of Mary Baker Eddy or other Christian Science literature. Not even an aspirin is permitted in these houses of horrors, and people often enter these facilities with advanced cancer or other serious diseases eating away at their bodies. 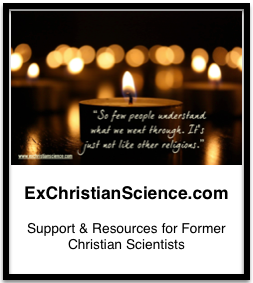 Before Christian Scientists will acquiece even to care at a Christian Science nursing facility, they will often have suffered at home on their own with whatever ailment they’re dealing with for quite some time. Any admission of advancement of a disease is an admission of failure in your practice Christian Science, and many Christian Scientists are loathe to admit such. For Christian Science Nursing to use nursing is incredibly misleading. Christian Science Nursing facilities should not be subsidized by tax payer money, and they should be very clear about what care at Christian Science “nursing” actually entails — no relief. Another guest post, My Mothers Turn to Medical Hospice (16) is the story of a Christian Scientist who turned to medical hospice care after being in a Christian Science facility that failed to meet her needs. Perpetuating the farce that Christian Science facilities provides any level of skilled nursing care is damaging to the patients and their families. I am horrified that Medicare pays for Christian Science nursing. Medicare pays for medical treatment (17), the Church’s position on Christian Science nursing — and the position taken by Christian Science nursing facilities — make it clear that there are no medical treatments given, means Medicare is paying for religion. The guidelines set up by the Church as to what Christian Science Nurses can and can’t do speak volumes. There is more to nursing than shifting pillows, offering juice, arranging food in a pleasing manner and reading Science and Health.